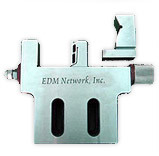 EDM Network Inc. offers new and refurbished Wire EDM Machines for purchase. A Wire EDM machine's electrode is essentially a wire that is electrically charged and when it comes in close proximity with a conductive metal or graphite, it causes a plasma discharge, a spark, that removes the unwanted metal along the path of the wire. The Wire EDM machines avoid erosion of the conductive material by having the wire wound between two spools so that the cutting surface of the wire on the Wire EDM machine is constantly being replaced with fresh wire off the spool. 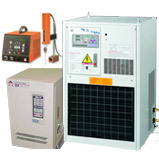 For more information about Wire EDM Machines, contact EDM Network today at 888.289.3367. 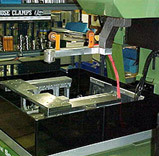 Rather than just a simple cutting Wire EDM Machine where the cutting area is simple punches in the material, there are multi axis Wire EDM machines available to add shape, tapers on the top, bottom or sides of the material being cut. 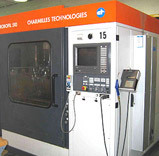 A multi-axis Wire EDM machine will help make the production process faster and more efficient. The cuts on a programmable Wire EDM machine will be identical every time, leaving out human error and perfecting your products. If worked by hand, a skim and rough cut can be easily accomplished with a Wire EDM machine, allowing the voltage to be lowered for finer finishing in the later cuts. For more information about Wire EDM machines from EDM Network Inc. please contact us about a particular unit or to ask questions to determine the perfect Wire EDM machine for you.